The holiday season had me crunched for time this year. I wanted to give some sort of food gifts to my family, but cookies weren’t an option because my sister Courtney does a gorgeous job with cookies each year, and I still haven’t been able to master fudge. There wasn’t enough time to bake bread, and there weren’t enough sticks of butter for cinnamon rolls. What I did have was plenty of half-used bags of nuts and dried fruits, old-fashioned rolled oats, honey, and pure maple syrup. Add some sesame and flax seeds, brown sugar, and unsweetened coconut, and you’ve got one tasty batch of granola just begging to be made. 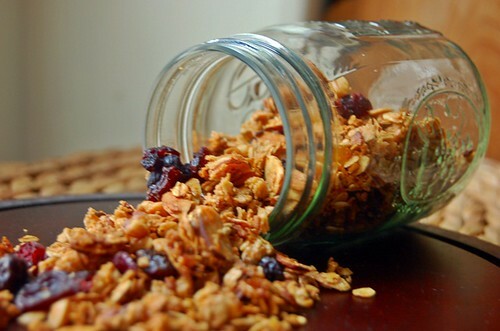 Making granola is as limitless as the boundaries of your imagination. Rather than following a strict recipe, I follow the Mark Bittman granola rule of parts – 9 dry parts to 1 wet part. Mix a beaten egg white into your granola before putting it in the oven. 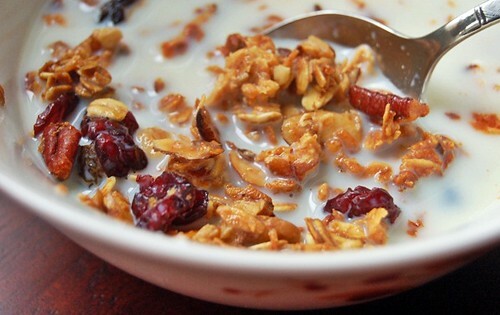 Always add dried fruits at the end, after the granola has cooled. Store in an airtight container for 3 weeks. Any longer and the nut oils may go rancid. Preheat the oven to 300 degrees and lightly spray a large, rimmed baking sheet. In a large mixing bowl, combine oats, nuts, seeds, coconut, and cinnamon. In a saucepan over low heat, combine oil, maple syrup, and brown sugar. Bring to a simmer and remove from heat. Gently pour the hot syrup over the dry ingredients and use a rubber spatula to mix everything together. Add the beaten egg white if you want clumpy granola. Spread the mixture on the prepared baking sheet in an even layer. Bake for around 25 minutes or until golden. While it’s baking, stir the granola around on the baking sheet from time to time so it will cook evenly. Gently break apart and add dried fruit. Store in a sealed, airtight container. Just a wee question. how do you get the print option? Hello! It should open a separate Google doc when you click “Print Version” at the end of the recipe. Hope that works!